Amy McMahan, co-owner of Mesa Verde in Greenfield, is one of the most intellectually curious people I know. And her curiosity guides her passion for wine. The last time I wrote about Mesa Amy in this column, it was when she showed up to my house with four bottles of wine in paper bags so we could blind taste them to see if we could guess the grapes without looking at the labels. We guessed them all correctly. Besides my friends who work in wine professionally, Mesa Amy knows more about wine than anybody I know. And she knows more than some of those professionals. One gaping hole in her wine knowledge? Blue wine. American wine drinkers have grown comfortable drinking pink. Rosé is all the rage. Even orange wine — white wine grapes left longer on their skins — has gained in popularity. 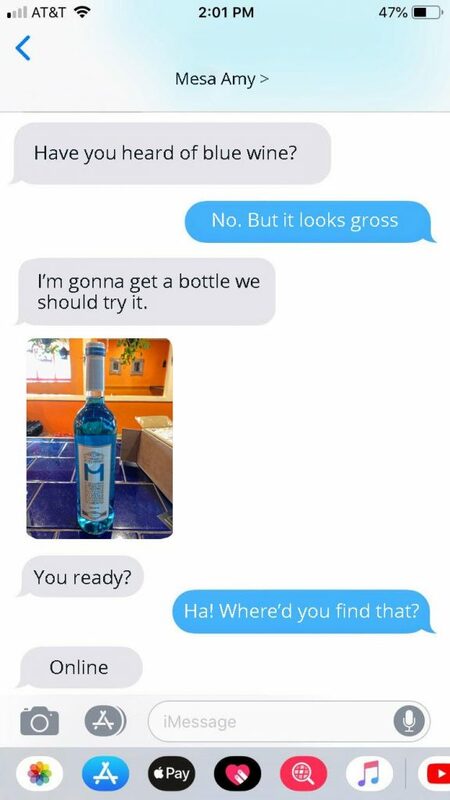 But blue wine? Could this be the next big thing? 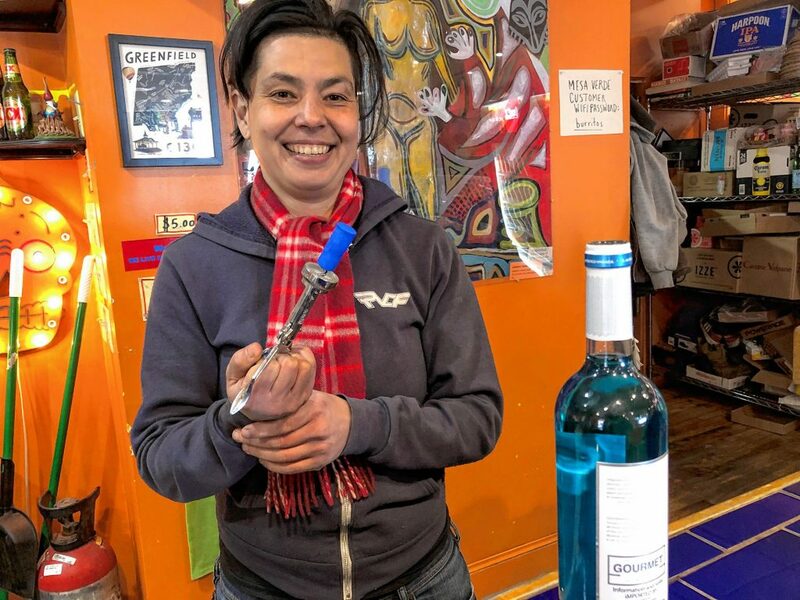 It was the headline, “‘Blue wine’ trend grows as Vindigo sold in France,” in the British wine magazine Decanter that sparked Mesa Amy’s cerulean curiosity. The big question: how do they make the wine blue? 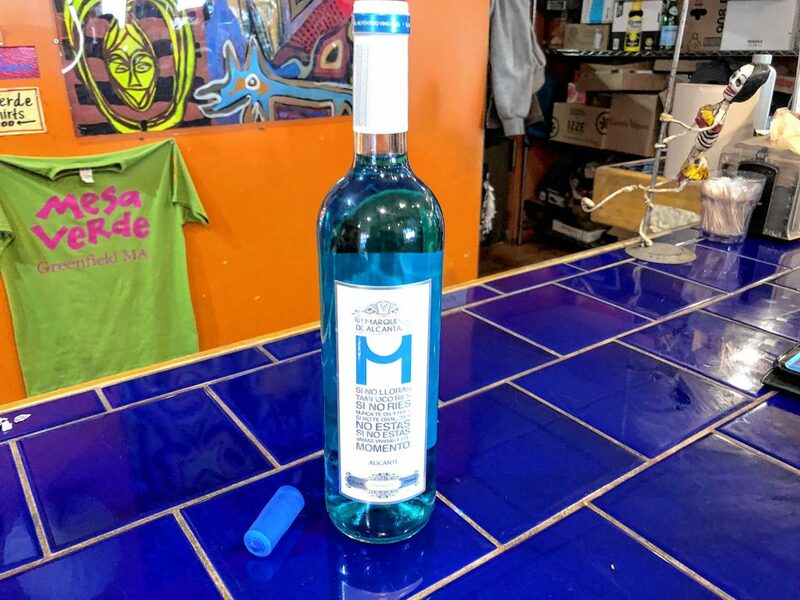 While the wine looks like bottled Gargamel urine after a three-course meal of Smurfs, it became blue neither by Smurf consumption nor by adding blue food coloring. 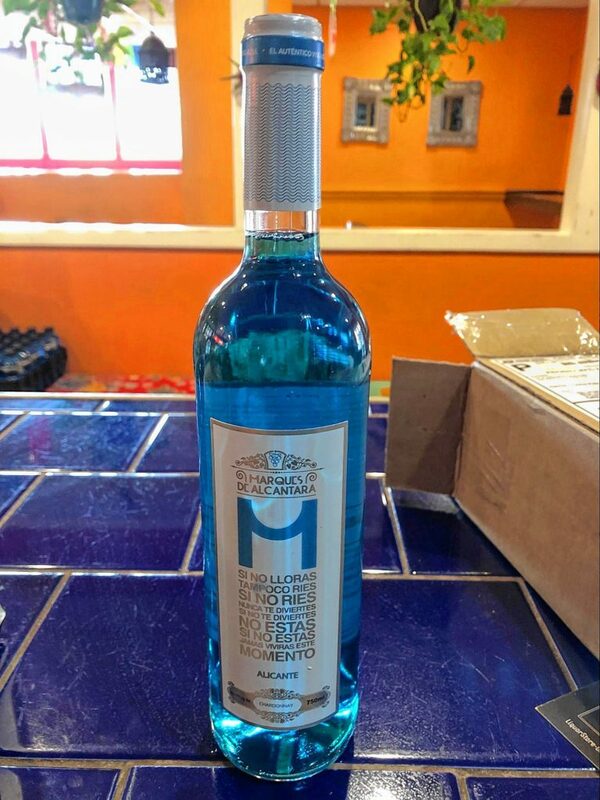 The way that this Spanish winemaker, Marqués de Alacantara, and other blue wine makers make their cyan statement is actually a natural process. Sort of. The wine starts out as a Chardonnay — a wine that most people recognize as white. But I’ll go to the bad English translation of the Spanish on Marqués de Alacantara’s website to help explain the “bluening” of the wine. In a Peugeot 206, in broad daylight and with great enthusiasm, he undertakes, Rubén Soto, the creator of the 100 percent Blue Wine, a business with many future views. This entrepreneur from Oriola is the only one who has come up with the key to making the 100 percent chardonnay blue wine, and with the help of his winemaker he discovered that the skin of the red grape has a pigment that, together with the white grape and the ink, give rise to the spectacular blue color of this wine, without chemical processes, which makes the product at the same time natural. The key to the “natural” process is extracting the water soluble pigment from red grapes, called anthocyanin, and adding it to the Chardonnay. Are they adding anything else to make this Chardonnay look like a liquified version of one of the forgettably named characters from Avatar? Who knows? I do know that even some semi-reputable winemakers will add a grape juice concentrate known as “mega purple” to color correct red wines. And some whiskey makers will add caramel coloring to keep consumers comfortable about their color. But if you’re going to seek out a blue wine in the first place, maybe you care less about exactly how it came about its azure hue. How does it taste? Mesa Amy pulls out the cork. The cork is, unsurprisingly, also extremely blue. I perceive the aroma of blue Slush Puppy from Cumberland Farms. Or maybe antifreeze (also available at Cumberland Farms). “Are you getting dirty diaper from this?” she asks. Mercifully, I am not. I am getting a ton of Hubba Bubba bubble gum. “I’m getting a little pineapple. I guess that’s the only nice thing I can say about it.” The so-called “wine” has now turned our tongues blue. I might not recognize this as wine at all if I were blind tasting it. I can, with some confidence, say that this is one of the worst wines I have ever had. It is not a terrible soft drink. But it is a terrible wine. The Wine Enthusiast rated a sparkling version of this blue Chardonnay at 81. That’s not bad on a calculus test, but any wine rated under an 89 using a 100 point scale is considered an abysmal failure. The writer of the review, Michael Schachner, writes “Made from Chardonnay, it smells of berry syrup and confectioners sugar. Its lean palate with cereal marshmallow and dried citrus fruit flavors finishes with artificial sweetness and a note of vinaigrette. Strange stuff for sure.” For a review in the Wine Enthusiast, this is a hilarious description. Suffice it to say, I really hope this blue wine trend dies here. “I think we’re going to have to file this away as a novelty experience that we never want to have again,” decries Mesa Amy with her glass-half-full even though it is, mercifully, now half empty attitude. Too bad that novelty experience has cost Mesa Amy close to $45 dollars. 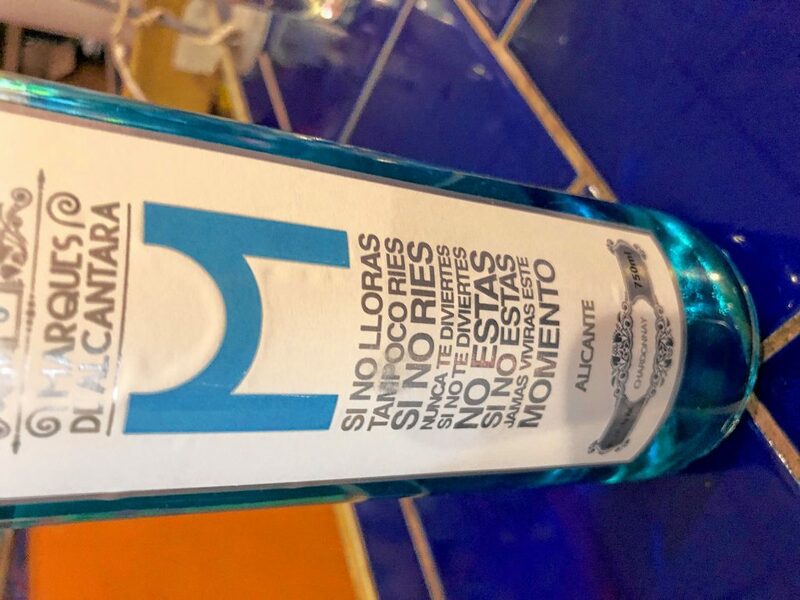 On the label of this blue abomination there is a Spanish adage that translates to “If you do not cry, neither will you laugh. If you do not laugh, you’ll never have fun. If you do not have fun, you are not there. If you are not there, you will never live this moment.” This wine certainly did make me want to cry. My radio station loves to espouse that “Different is Good.” And I do believe that statement is true blue. And what is also true blue is that it is really fun and exciting to experiment with something like blue wine. But trying it once is certainly enough. Luckily, Mesa Amy had a beautiful bottle of Grignolino del Monferrato “Casalese Euli” to cleanse our palates and wash the blue from our tongues. There’s nothing like a delicious Italian red to cure your blues.